I’m not a big fan of ranking players across positions. It doesn’t make a ton of sense to rank a running back next to a tight end next to a guard and so on. It does make for fun conversation, however. When I make these lists I do take the time to offer my thoughts on each player so you can at least have a clear understanding of what I think of each, rather than just dropping a list of names. On a macro level recruiting rankings have great value. Over time the players at the top of the lists will be better than the players at the bottom, again, on a macro level. While rankings do have value, athletes should not care about them because individually they pose the potential to be the outlier, or the micro level player who throws a wrench in the macro level recruiting actuaries. Rankings are just opinions, and I base mine off who I think has the highest ceiling coupled with who I think will reach that ceiling. It requires much more than just dominant physical traits. The NFL is littered with less gifted athletes than those out working in the real world. 100. WR Ja’Kori Morgan, Clear Lake, 6-2, 190 – Houston: I thought he was going to become a much bigger name but I’m sticking with him. I really like what I saw of his senior year. He’s in the template of Al’vonte Woodard, just not as explosive. 99. RB Brock Sturges, Allen, 5-10, 200 – Arizona State: A bit similar to Eno Benjamin who picked ASU last year. Quicker than fast with good ability between the tackles. Solid vision, feet, and power that belies his size. 98. CB JayVeon Cardwell, Cibolo Steele, 6-0, 170 – Oklahoma State: Slick athlete for man; good eyes and awareness in zone. They’re well-schooled out of Steele. 97. RB Nakia Watson, Austin Westlake, 5-11, 215 – Wisconsin: Good feet and balance; strong lower body to give defenders fits. Seems to gather speed the more room he gets. He won’t be fun to tackle in the secondary. 96. LB Jacob Mangum-Farrar, Kempner, 6-3, 215 – Stanford: Really fluid player for this body type. Still sort of new to the position. I wanted to see him take the next step with physicality this season and he did. He showed good range, sideline to sideline. He’ll fill out well. 95. OL Christian Jones, Cy Woods, 6-6, 285 - Texas: Incredibly raw but incredibly rare size and athleticism. Justin Wilcox and Derek Mason wanted him which speaks to his defensive upside. He’ll start out on the offensive line which lengthens his developmental curve but he does have left tackle traits worth exploring. 94. WR Ke’von Ahmad, Colleyville Heritage, 6-1, 183 – UCF: At worst he’ll be a reliable chain mover but I think he can be more thanks to his ability to get open and also go up and attack the ball. 93. OL Braeden Daniels, Hebron, 6-4, 260 – Utah: I wasn’t familiar with him but being committed to Utah will always catch my eye because of their developmental track record. Athletic kid who bends well. Give him some time and the Utes may have another steal from Texas. 92. OG Ian Burnette, Wimberley, 6-3, 305 – TCU: The Horned Frog offense wants interior guys who create space for quick-hitting run plays. That’s where Burnette comes in. He’s a powerful kid with some solid movement skills. He also played defensive tackle at times. 91. LB Nicholas Bolton, Frisco Lone Star, 5-11, 230 – Missouri: Loose hipped and safety’s feel in pass coverage. Bolton also assertively downhill. Gary Pinkel had a great track record in Texas and I like what Barry Odom has done in-state this cycle. It won’t help them secure the bag in UT territory or anything, whatever that is. 90. WR Stefan Cobbs, Keller Fossil Ridge, 6-0, 170 – Boise State: Similar to Ahmad. I don’t know if he’ll be a game-breaker on the ground but he’s fluid with great body control to make plays in the air. Seems to have terrific hands. If he was a burner we’d be talking about a Top 30 player. 89. QB Matthew Baldwin, Lake Travis, 6-3, 195 – Ohio State: Has an ‘all points’ arm that forces coordinators to account for the whole field. Shows good feel and anticipation in the pocket, plus the zip and accuracy to fit tight windows. Will he be recruited over at Ohio State? Possibly, but as a Lake Travis quarterback we know he’s patient enough to wait his turn. 88. APB Ta’Zhawn Henry, Houston Lamar, 5-8, 175 – Texas Tech: Henry’s a rock you can give the ball to horizontally from the slot or stretch the field vertically down the seam. A true APB who is very tough to tackle in space. I imagine the’ll get him involved in both the run and passing game. 87. DE Braden Cassity, Austin Westlake, 6-2, 240 – Oklahoma State: This guy is a pretty impressive athlete. I checked to make sure I wasn’t seeing things and he was tested at a 4.38 shuttle and 35″ vertical. That short area explosiveness will serve him well coming off the edge or especially if he grows into an interior player, which I wouldn’t rule out. 86. DT Jaxon Player, Waco Midway, 6-0, 285 – Tulsa: Speaking of short area quickness, that’s the primary reason I have Player ranked. His ability off the ball is very rare, and from an evaluation aspect, partially compensates for his length. 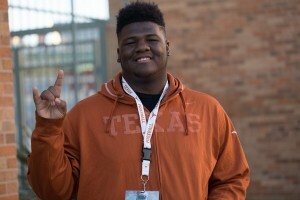 If he becomes a refined technical player to help keep offensive linemen off of him, Tulsa may have found its Poona Ford. Lateral quickness will help pursuit down the line. If he was 6-2, he’s be a household name. Funny sport. 85. CB Erick Hallett, Cy Fair, 5-10, 170 – Pittsburgh: Hallett’s an exceptional athlete as measured by combine tests, but it also shows up on tape. He’s sticky in coverage and turns into a receiver when the ball is in the air. He could play receiver in college, in fact, but corners are harder to find. He could be a punt returner as well. 84. TE Christoph Henle, The Oakridge School, 6-5, 245 – Baylor: Too many care about speed when it comes to tight end but I look for fluidity and ability to find open spaces in defenses. Henle seems to have that as well as that endearing lumbering quality even the best tight ends have when running down the seam. He blocks with good leverage when attached. 83. 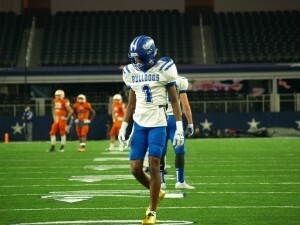 WR Myller Royals, Abilene Cooper, 6-4, 180 – Texas Tech: I was sold after I watched the first play of his junior film. Everything about that is telling. Great length, light on his feet when feints inside, fluidity in tight quarters, vision in the open field, and the ability to open up his gait and house it. Traits on traits. Could they have another promising receiver in the mold of TJ Vasher? 82. DL Otito Ogbonnia, Katy Taylor, 6-3, 300 – UCLA: Fluid for that body type and strong, Ogbonnia looks like a classic two-gapping nose tackle. If I were on a coaching staff I’d be very curious what he’d look like at offensive guard. 81. ATH Maurice Washington, Trinity Christian, 6-1, 190: Has played running back but he’s a bit of a wild runner. I’ve seen that style before with Brandon Williams and Corey Dauphine. My read is safety. He’s a good athlete. 80. LB Jarrell Cherry, Dallas Carter, 6-3, 225 – LSU: This ranking will catch some people by surprise but his senior year just wasn’t what I was hoping to see. In fact, I think I saw more explosiveness in his sophomore year. He seems a bit more rigid too. Rather than being an edge player in Baton Rouge, I figure he’ll play ILB. 79. DB Isaiah Humphries, Sachse, 5-11, 190 – Penn State: His dad played at PSU as well as in the NFL. Not surprisingly Humphries seems to be a very intelligent center fielder at safety. He does a great job of reading the quarterback. 78. ATH Stanley Hackett, Sam Rayburn, 6-3, 205 – Baylor: Really good athlete but a bit of a tough projection at this point. Athletically more comfortable at running back. By now I figured he might out-grow the position but the fluidity is still there. He’s going to a good coach to find his best utility. I’d bet he ends up on defense in a edge role. 77. S/LB Dayven Coleman, West Mesquite, 6-2, 205 – Arizona: He plays a Jason Hall role as a +1 defender in the box. Often when he went unaccounted for he would light someone up. He has good size, moves very well, and hits like a ton of bricks, but what’s his role in college? Can he be an every down linebacker? That would be interesting to see. 76. QB John Holcombe, Summer Creek, 6-4, 225 – Kansas State: I account for fits when I rank players and there might not be a better fit for a player than KSU for Holcombe. But what about after Bill Snyder retires? Not worried about that as Holcombe is a good dual option the next coach will take advantage of. Holcombe’s improvement in a relatively short period of time is impressive. Also, worst case scenario he’s a giant athletic guy. He’ll find a home even if quarterback doesn’t work out (I think it will). 75. DB Christian Young, Richmond Foster, 6-1, 200 – Arizona: This guy looks like he might grow into linebacker but then you see him in coverage and he shows great safety range. He should be an intimidating guy because he puts that range to work; if he’s not creating a turnover, he’s lighting someone up. 74. OL Darrell Simpson, Justin Northwest, 6-7, 340 – Oklahoma: He has a long way to go but OU has a great track record of turning project offensive linemen into players. There are some nice baseline attributes to work with; he’s pretty quick at that size. 73. OL Barton Clement, Fort Bend Marshall, 6-2, 310 – Texas A&M: He’ll need to reshape his body and I don’t think he’s the 6-3 he’s often listed at, but he comes off the ball and finishes blocks well. With proper development he’ll be a solid interior player. I also wonder if there’s center upside to explore. 72. CB Starrland Baldwin, Cy Falls, 5-10, 170 – Oklahoma: One of the 2-3 quickest players in the state. He’s not just quick, however, he can open it up and run with a long gait. Great hips. There’s some return ability here as well. Reminds a bit of Kobe Boyce from 2017. 71. LB Chad Bailey, Fort Bend Ridge Point, 6-0, 240 – Missouri: Bailey is a box enforcer; a true knock-back tackler. It’ll be tough sledding in Columbia with he and Bolton. If Bailey was taller he’d probably be headed to the defensive line. 70. WR Montel Parker, Dickinson, 6-2, 180 – Texas A&M: Parker’s an above average athlete who has played both quarterback and receiver in his career. He reminds a bit of Damion Miller from 2017, though Miller had a bit more burst. 69. ATH Julon Williams, Converse Judson, 5-9, 180 – Houston: He’s an electric player with the ball in his hands but I see him more ideally suited for slot in the Air Raid than the new Houston offense. Those are mild concerns, Williams is a pure football player and will find a role. 68. DL Josh Landry, Houston Lamar, 6-3, 250 – Baylor: Strong hands, a great motor, and some versatility to play up and down the line depending on the situation. Landry’s done a great job of improving his body and is on a solid trend. 67. OT Connor Galvin, Katy, 6-6, 260 – Baylor: Another upside player for Baylor, the main question here is how long will it take Galvin to put on the requisite weight. If there were no weight concerns he’d be a Top 25 player in the state. 66. WR Joshua Fleeks, Cedar Hill, 5-11, 170 – Baylor: The amount of speed in Baylor’s class is well known and Fleeks is yet another burner. He profiles to the slot. 65. DB Tanner McCalister, Rockwall-Heath, 5-11, 190 – Oklahoma State: He’s played a lot of corner and running back but I think he’s headed for safety and that’s a good thing. He runs well and is fluid but I don’t know if he’s twitchy enough for corner. At corner he’s about as good as you’ll find in run support. That obviously translates well to safety. 64. LB Jacoby Simpson, Aldine MacArthur, 6-0, 225 – TCU: He’s an ILB all the way, but within that designation he’s a plus athlete. When he has a good read on the play he arrives quickly with bad intentions. Gary Patterson has the coaching chops to make a mockery of this ranking. 63. DE Ochaun Mathis, Manor, 6-4, 235 – TCU: I don’t know if he’s that tall, but he’s a quality edge rusher who can get in the backfield by running the arc or stunting inside. He also seems to read his keys quite well. I just watched him again and this ranking might be unjust. 62. WR Miles Battle, Cy Creek, 6-4, 190 – Ole Miss: Initially I questioned how fluid Battle was but senior tape alleviates those concerns. He’s a vertical threat with size and ball skills and he’s probably going to be better in the open field than I initially thought. 61. WR Michael Woods, Magnolia, 6-1, 190 – Arkansas: He was committed to SMU under Chad Morris and the new Arkansas coach quickly made sure Woods followed him. Woods plays small and quick, but also plays much bigger than 6-1. With his long arms he can go get it. I’m expecting big things in this offense. 60. OL Trey Stratford, Allen, 6-4, 290 – Stanford: He battled injuries at times this year but when healthy I like what I saw. When Stanford goes for the flip you’re having a good year. I like him at center long-term. 59. WR Kameron Scott, Manvel, 6-2, 170 – Missouri: Slippery and skilled, at times Jalen Preston complemented Scott. Despite the sinewy build, Scott plays strong. With some development he’ll become another downfield threat for Texas. I was high on J’Mon Moore when he came out too. 58. CB Gemon Green, Desoto, 6-2, 170 – Michigan: When you see a tall corner you expect him to struggle playing ‘off’ but Green is fluid for that length. I’m not saying he’s Holton Hill, but there are some similarities here. 57. DT Calvin Avery, Bishop Dunne, 6-2, 310 – Illinois: He was a wrecking ball in the middle for Dunne, though you have to account for level of competition. Still, he’s obviously powerful at the point of attack and athletic on the move. 56. 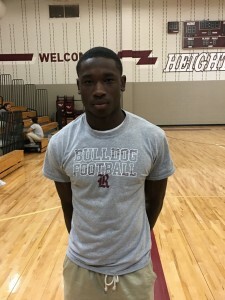 WR Jalen Knox, Mansfield Timberview, 5-11, 185 – Missouri: With all the variants of ‘Jalen’ in the state this year three of them could easily play slot at Texas. Knox is very explosive and elusive in close quarters. He has big play ability. 55. OL Victor Curne, Second Baptist, 6-5, 320 – Washington: I think he’s a good enough athlete that if he leaned up he could play tackle. He reminds of Caleb Benenoch in that regard. That written, guard is his ceiling. Curne is going to a great program that will maximize him. It says a lot about Curne that Chris Petersen is recruiting at such a high level and still came to Houston for him. 54. ATH Taye Barber, Cy Springs, 5-9, 185 – TCU: Barber plays like he tests, extremely well. On top of it he’s a pure football player, whether he’s making a huge play, a physical tackle, or springing the key block. TCU has a great track record with ‘small’ players. Barber will likely have both coordinators fighting for his services. 53. LB Bumper Pool, Lucas Lovejoy, 6-2, 215 – Arkansas: I want to rank him higher because he’s a natural, instinctive linebacker which is rare these days. He seems decently fluid too. He does lack burst. 52. DB Trevon Moehrig-Woodard, Smithson Valley, 6-1, 190 – TCU: Where’s the senior film? TMW is a playmaker on defense who can flip the field instantly. He has good coverage skills as well as return ability. I think his upside is at safety, though corner is a possibility. 51. 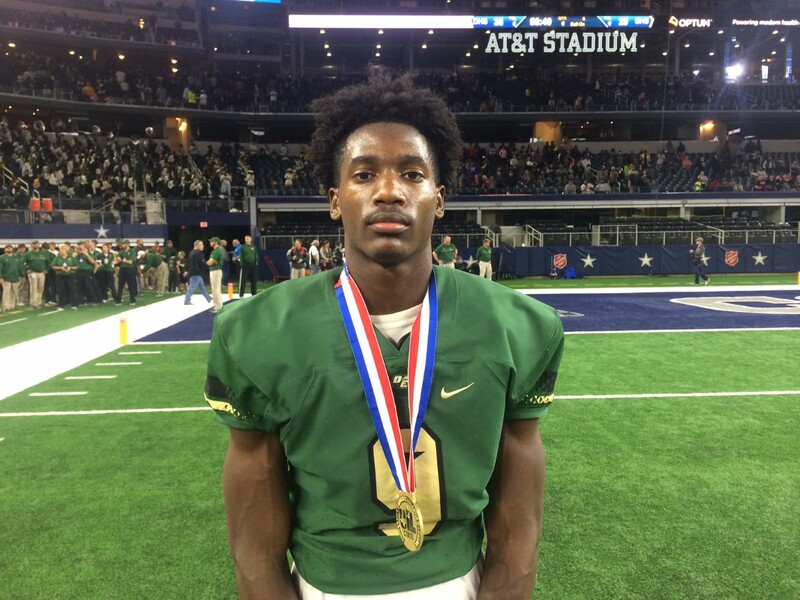 WR Treveon Johnson, Brenham, 6-1, 180 – SMU: Johnson’s a tough evaluation because I could see him flourishing on either side of the ball. He’s an explosive and fluid athlete with good length. The pay day could be at corner but if that doesn’t work he could easily play receiver, either inside or out. 50. QB Jalen Mayden, Sachse, 6-2, 215 – Mississippi State: Mayden was going to be an excellent fit for Dan Mullen’s offense as a solid passer and selective, yet productive runner. With Joe Moorhead leaving Penn State for Mississippi State I think Mayden still has a bright future. 49. WR Erik Ezukanma, Timber Creek, 6-2, 180 – Texas Tech: Ezukanma is ultra smooth which means he’s going to be a terrifying route runner. He also catches the ball with ease. There’s solid after-the-catch ability and he does a good job of climbing the ladder. He’ll move a lot of chains. 48. OL Jacobi Lott, Amarillo Tascosa, 6-5, 310 – Kansas: At times on film he looks like Darius James. I recall writing, “James gets up and moving like he has fire ants in his sleeping bag.” That applies here. Lott has a quickness about him from top to bottom that’s rare. He also seems to have a nasty streak. He appears to be a really good athlete. Kansas must be ecstatic. 47. LB Alston Orji, Rockwall, 6-2, 230 – Vanderbilt: Loved his traits as a sophomore. Didn’t like his junior film much. Really liked what I saw on tape this year. Vanderbilt coach Derek Mason is getting an athletic and explosive piece. Orji wouldn’t look out of place on some of Mason’s good Stanford defenses. 46. OT Frank Filip, Clear Lake, 6-7, 280 – Colorado: I must be missing something on Filip, either that or a lot of schools are. I did some homework on him and heard positive reviews. He looks to have all the necessary traits of a left tackle, especially length and flexibility. Notre Dame pursued late. 45. DB Trent Gordon, Manvel, 5-11, 180 – Penn State: Some guys have nickel/safety upside, Gordon is on the other end where he has corner/nickel potential. He spent a lot of time patrolling the middle of the field for Manvel but he’s loose-hipped and built more like a corner. 44. TE Brayden Willis, Arlington Martin, 6-4, 220 – Oklahoma: Where’d this guy come from? Sheesh. He appears to be very well-rounded with solid athleticism. His tenacity really sets him a part. He’s a bully who plays like he hasn’t been recruited for most of his career. I love the fit. OU knows how to get guys like this involved. He’s a steal. 43. QB Clayton Tune, Hebron, 6-2, 205 – Houston: Does this guy have good timing or what? He looks like a dream fit for the soon-to-be installed Briles offense. He has a plus arm and is a deceptive athlete. He could have been a QB2 for any school in the country and a QB1 for almost all of them. He is very competitive to boot. I think he ends up starting a bunch of games in Houston. 42. DB Cam’ron Jones, Mansfield, 6-0, 200 – Nebraska: Excellent speed and range. One of the fastest football players in the country on the track. Reminds of some of the plus athletes Nebraska had in the secondary in the 90’s-early 00’s. Athletic and he’ll hit you. 41. 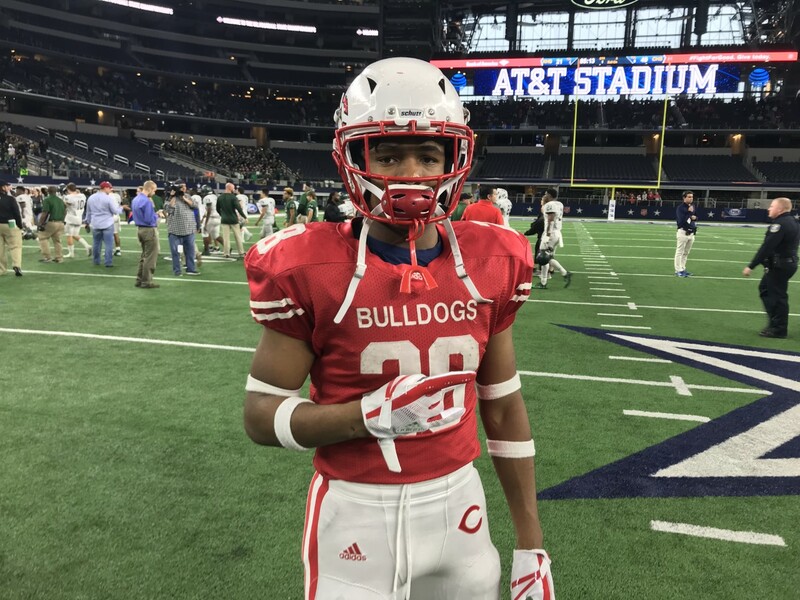 ATH Jaqauyln Crawford, Rockdale, 5-9, 160 – Oklahoma: He best projects to slot receiver where he can use his short area quickness, but you can’t rule out corner if he has the temperament for it. He can make some incredibly difficult plays look easy. I bet he returns some punts for points too. OU will have a lot of competition in the slot. 40. OL Kaitori Leveston, Waco Midway, 6-5, 290 – Kansas State: He could play any position on the offensive line. That versatility has some staffs wishing they would have pursued him sooner. Very intelligent player who is also good technically. Could be a phenomenal center. K-State can evaluate and they recruited him like he was a five-star after Texas came calling. Their effort will be rewarded sooner rather than later. He won’t need as much time to develop as some others. 39. 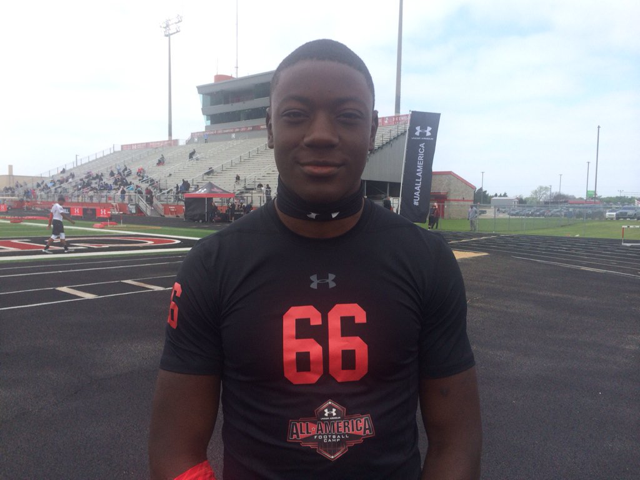 LB Byron Hobbs, Eastern Hills, 6-4, 220 – Texas: Upside, upside, upside. Hobbs is young for his grade and still nowhere near filling out. His athleticism is evident whether on the hard-court or lined up on offense or defense. He had me sold on a 90 yard touchdown reception his junior year. He’ll need to get more physical and learn to play with shock power at the point of attack. That should come as his frame fills out. He has all the athletic traits to excel as b-backer in Todd Orlando’s defense. 38. DL Bobby Brown, Arlington Lamar, 6-5, 280 – Texas A&M: Great build, great length, and plenty of athleticism. Brown needs to be more consistently dominant. He has as much potential as anyone in the class. 37. DL/OL Chasen Hines, Marshall, 6-2, 330 – LSU: I think his ceiling is at guard but he’s intent on playing defensive tackle. He has the foot quickness and lateral agility to do it, I just think he has the potential to be an absolute road grader for whatever stud back LSU has at the time. He’ll need to keep his body in check, he’s just a naturally powerfully built guy. 36. 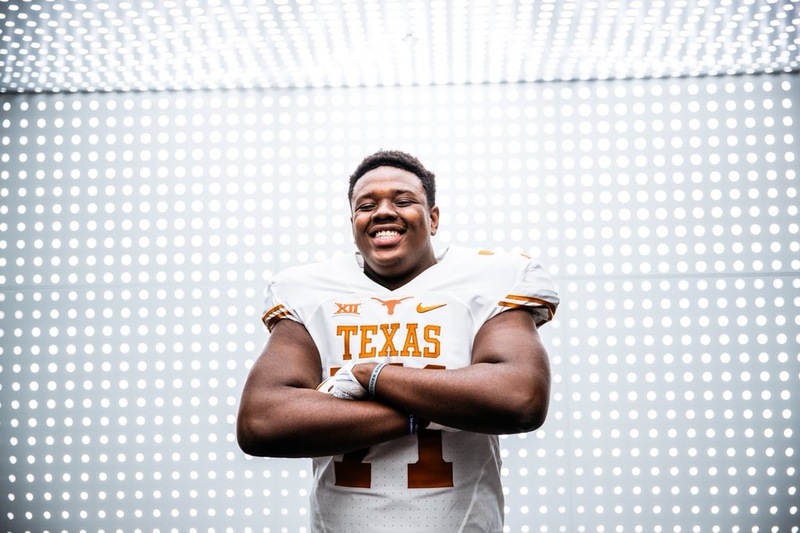 OL Rafiti Ghirmai, Frisco Wakeland, 6-4, 290 – Texas: In a down in-state cycle the staff did well to identify Ghirmai early and hold quality suitors off late. Ghirmai shows tackle athleticism and flexibility but he may end up at guard depending on what the depth chart looks like in a year or two. 35. 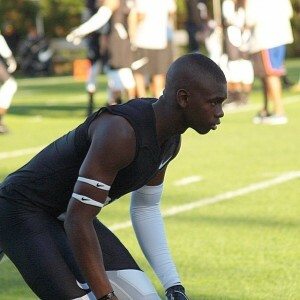 WR Tommy Bush, Schertz Clemens, 6-5, 190 – Georgia: Bush is another upside player who to this point is still raw. His high school offense did him no favors so we still don’t know exactly what he’ll become. His size/speed combination makes him an uncommon prospect, but I also like how he gets off the line of scrimmage and into his route. He still has a ways to go but with his work ethic I think he’s a safe bet to make major strides. Even if he lacks nuance as a route runner a vertical threat with his length and speed has a ton of value. 34. TE Malcolm Epps, Dekaney, 6-5, 220 – Texas: He plays almost entirely flexed out as a wide receiver so he’s an unknown as a blocker. However he has a great frame to add strength and has the body mechanics to allow him to win the leverage game while playing attached. Whether he becomes a good blocker will be entirely up to him. He has some very impressive defensive film and you’d mistake him for an outside/rush linebacker if you didn’t know he also played offense. That defensive film serves as a positive indicator for his blocking want to. 33. WR Josh Moore, Yoakum, 6-1, 170 – Texas: Moore’s an interesting guy. He looks like a corner, plays like an outside receiver, and might be destined for slot at Texas. He tests extremely well but that explosiveness doesn’t always show up on the field. He is certainly athletic, though. It’s going to be really interesting to see how his ability best translates. I think he could be an explosive slot because of his stop-start as well as his ability to run the seam. 32. DB Leon O’Neal, Cy Springs, 6-1, 195 – Texas A&M: O’Neal has great size and is one of the harder hitters in the state. I’ve heard some question his speed but that’s not a big concern of mine. Some questioned Armani Watts’ speed which I thought was way off (Watts was incredibly fluid, though). My concern for O’Neal is in coverage. He seems to best fit playing downhill in the box rather than a jack-of-all-trades safety. 31. DB Christian Morgan, Porter, 6-0, 190 – Baylor: Morgan is one of the best athletes in the country, period, and it shows up on film. 4.56 40, 4.03 shuttle, and 42.8 vertical! When I first saw him as a sophomore he was more athlete than football player. He’s come a long way. He uses his eyes well to make plays on the ball and that athleticism really translates when he sticks his foot in the ground and drives downhill. Matt Rhule must be pinching himself. 30. OL Luke Matthews, Fort Bend Elkins, 6-3, 300 – Texas A&M: I think it’s a pretty safe bet he finds his way to the field and has a solid career at a minimum. Mike was a center, Jake was a tackle, and Luke seems tailor made for guard. He comes off the ball well, keeps a good base, and sticks on his block. I imagine he’s a much better run blocker at this point and that’s pretty typical. 29. 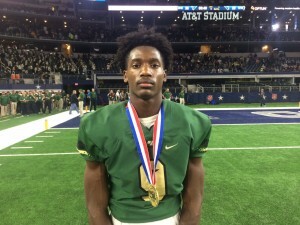 WR Jaylon Robinson, All Saints, 5-10, 170 – Oklahoma: With the name, the school’s color and being a private school, and the position he plays, he might remind you of a certain someone. Robinson isn’t quite as spectacular as Jaylen Waddle but he’s a hell of an athlete and a good route runner. I predict he’s a nuisance for the Longhorns for years to come. OU never lacks for receivers. 28. 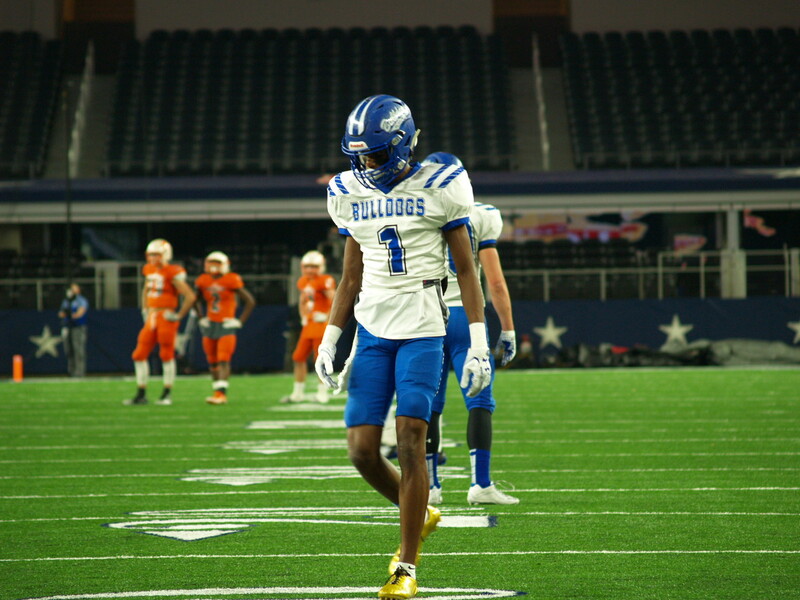 DB Jordan Moore, Yoakum, 5-11, 190 – Texas A&M: I like guys who play running back in high school but project to defense because you get a clear picture of their hips, foot quickness, and tenaciousness. My verdict on Jordan is he has great attributes to be a nickel. It’s a demanding position but he should have the physical requirements to perform at a high level. 27. 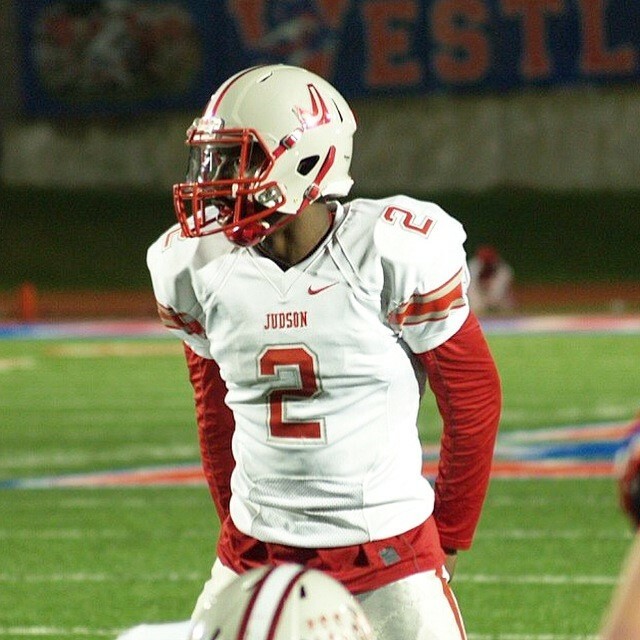 DE Tyree Wilson, West Rusk, 6-5, 230 – Texas A&M: What a great senior year he had. His length coupled with burst off the edge give him an immense ceiling. Now factor in that his frame has plenty of room to fill out and I predict big things for Wilson after some time to develop. The Aggies had to hold off a late push from Arkansas and they did. That’s quietly a big development. Huge upside and I think he has a very safe floor. I was a big Daeshon Hall guy but Wilson’s senior year is as good as anything I saw from Hall. 26. 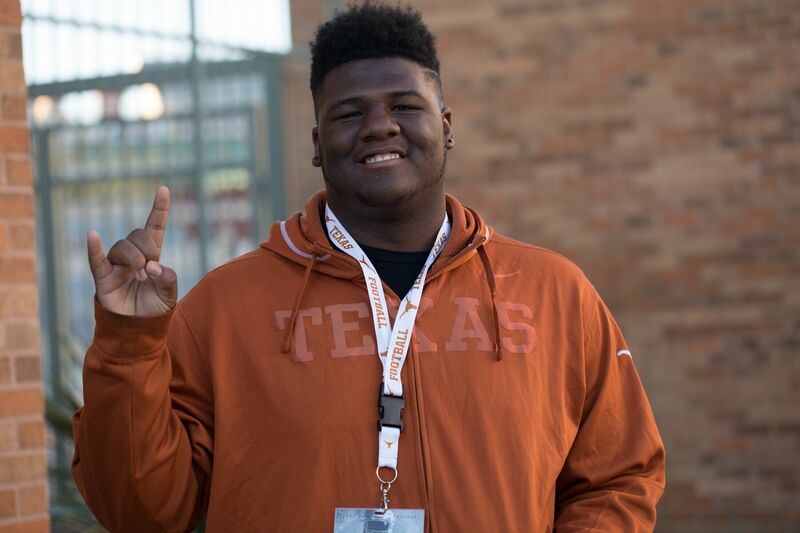 OT Reese Moore, Seminole, 6-5, 280 – Texas: Moore is an athlete trapped in a big man’s body. That’s okay, it’ll get him a “free” education and might get him paid one day. He played tight end most of his career but as an attached blocker. He has a lot to learn regarding his new position, and the curve gets longer because of the giant leap in competition, but I think Moore has the right mindset to put in the work to realize his potential. You’d be hard pressed to find a better ball of clay to work with. He’s a good enough athlete to get by with so-so technique after a red-shirt. Once he’s fully developed he could be special. 25. QB Tanner Mordecai, Waco Midway, 6-2, 215 – Oklahoma: Mordecai has one of the biggest arms in the country but he also throws a very catchable deep ball. Like Tune above, he’s a good runner with surprising top end speed. He shows great leadership ability, not just vocally but with action. Few and far between are as good at improvising as Baker Mayfield, but Mordecai is good at breaking the pocket and putting defenses in conflict with the run and pass. He throws well on the move. He has the talent to fully weaponize Lincoln Riley’s playbook and he’ll also have the surrounding talent. 24. 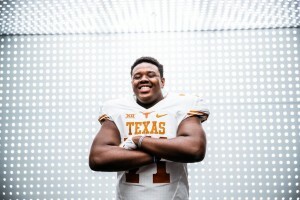 DT Keondre Coburn, Westfield, 6-1, 330 – Texas: Coburn’s a brute at the point of attack, able to get a push even against double teams from Houston 6A schools offensive lines. Laterally he shows surprising quickness. He has a lot of pop in his hips that helps him generate force. He’s not tall, but that’s not a hindrance at nose tackle and it’s often a plus. It’s going to be really hard to move the line of scrimmage with him in the game. His ability to stack and shed offensive linemen in the run game give him a high floor. There’s also some initial quickness you don’t expect. Coburn will need to be in great condition upon arrival to Texas as he’ll likely be needed early in his career. 23. OT Colten Blanton, Cy Ranch, 6-7, 280 – Texas A&M: My main concern with Blanton is he’s a bit narrow from top to bottom. It may be tough for him to anchor against some of the grown men he’ll face. However, he may combat that just find because he shows the ability to play with good leverage at his height. For such a tall guy he doesn’t look out of place when pulling. There were very few true quality tackle options in-state but A&M got one here. 22. LB DaShaun White, Richland, 6-0, 215 – Oklahoma: Rare is the linebacker who can play sideline to sideline and make credible drops in pass coverage but White is that guy. He first jumped out to me with his physical nature as a junior but it’s his speed and movement skills that really won me over this year. These guys don’t grow on trees. OU has a great piece to pair with Kenneth Murray from 2017. 21. DB Atanza Vongor, South Grand Prairie, 6-1, 200 – TCU: Fantastic build and amazing change-of-direction ability. With TCU’s three safety system he’ll be on the field as soon as he’s mentally ready. I can’t recall them getting a safety with his upside. He has great range and you’d be hard pressed to find a safety with better man coverage skills, save perhaps Caden Sterns. 20. RB Craig Williams, Crosby, 5-9, 170 – Baylor: If you watched Williams’ film and also saw how Baylor used freshman Tristan Ebner out of the backfield this year you probably understand why I have Williams ranked this high. He’s an absolute blur out of the backfield, but he’s also a home run hitter as a ball carrier. Williams can play for any school in the country. His ability to get to top speed in very few steps is uncanny. It’s either Williams or Waddle for best play speed in the state. Rhule did a great job here. 19. WR Al’Vonte Woodard, Houston Lamar, 6-2, 190 – Texas: I told readers of IT he’d have a down year production-wise because of Lamar’s issues at quarterback and unfortunately that was accurate. No matter, the traits are there and he actually grew an inch and a half. When he first hit the radar as a sophomore he a one-trick deep threat. Over time he’s put in the work to become a much more well-rounded player. It’s to the point now where he projects to play both inside and outside. Along with his improved length he has an excellent build that will only get stronger. Woodard plays faster than he tests and he doesn’t test poorly. He’s also a very capable blocker. 18. DL Max Wright, Katy Taylor, 6-3, 270 – Texas A&M: He’s had bad luck with injuries but when he’s healthy he’s a devastating defensive linemen. To my eyes he’s not a 4-3 defensive end that runs the arc, though you’d have trouble running on him in that look. He looks like a 3-4 defensive end capable of using his size to hold up versus the run and quickness to get in the backfield. In a four-man front I expect Wright to move inside, at least over time. With an infectious personality I expect him to become a team leader. 17. WR Brennan Eagles, Alief Taylor, 6-3, 215 – Texas: Eagles was hampered by injury for much of this year. His profile is pretty straight forward, he’s a very big, physical receiver with exceptional ball skills and incredibly strong hands. He tests extremely well in the speed categories. I’d like to see that translate more after the catch. He should be trouble running the high numbers on the route tree. He has a very safe floor but his ceiling as a player will be determined by winning deep and yards after the catch. 16. WR Caleb Chapman, Clear Brook, 6-4, 210 – Texas A&M: For such a tall guy he can really sink his hips when he’s not just running deep routes past defenders. He does a great job of tracking the ball in the air and ha great timing when it’s time to go get it. Shaking his hand is emasculating. That thing goes up to your elbow. He’s a bit lean right now but has a lot of room to fill out. Some might think this is too high for him but I think he has a good chance to play on Sundays. 15. QB Spencer Sanders, Denton Ryan, 6-2, 190 – Oklahoma State: Without the injury history he’d be a top-10 player to me. He can punish you with his legs or arm. He does well to improvise behind the line of scrimmage. When it’s time to run he’s assertive and ‘fast enough’ to pick up chunk yardage. He has great leadership qualities and plays with tremendous poise. Mike Gundy has won a lot of games with lesser talents. With Sanders’ legs we’ll see an added dimension to the Cowboys’ offense. Scary. 14. 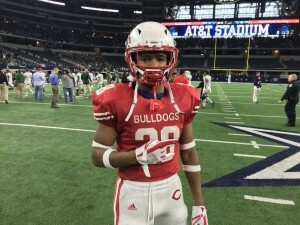 RB Keaontay Ingram, Carthage, 6-1, 190 – Texas: He’s a complete and natural feature back. He can run inside behind his pads and outside with tremendous one-cut ability. One play he’ll be patient to let the play develop, the next he’ll bear down and get what he can. He’ll fill out to 215+. Comparisons in style to Arian Foster are apt. He’s not a burner but he can break off long runs. Ingram rarely takes a loss in the back field and his agility in close quarters is uncommon for a back his size. He has great vision and the feet and balance to take advantage of it. 13. WR Te’Vailance Hunt, Texas High, 6-2, 185 – TCU: He’s a touchdown threat from anywhere on the field. He has flair for the dramatic one-handed play. Can take a slant or screen to the house. Can hit an extra gear you didn’t know he had when he needs it. First time I saw his highlights I thought I was watching Sammy Watkins. Just what TCU needs, another game breaker outside. 12. DL Vernon Jackson, Boling, 6-3, 240: I was astounded to watch him run the ball. I knew he was a running back but I just expected him to crash into the line and take defenders with him like a strongman pulling an 18-wheeler. Instead I was able to see how incredibly nimble he is at his size and actually break into the open field a number of occasions against an unfairly fast Newton defense. It’s really hard for me to see those traits and not think he translates to defensive line in a major way. 11. DL Moro Ojomo, Katy, 6-2, 265 – Texas: By now everyone knows his story. Ojomo is only 16 years of age and only came into his own this past season. The fist ever early bloomer/late bloomer. He’s exceptionally quick off the line, plays with great power, and a non-stop motor. He’ll fill out and wreak havoc in Austin for the next 3-4 years. He’s an excellent scheme fit as Orlando likes to employ a very active front. Ojomo isn’t designed to catch blocks and that won’t be asked of him. 10. CB Anthony Cook, Houston Lamar, 6-0, 170 – Texas: As technically gifted a high school corner as you’ll find. Great feet and swivel hips help him transition out of his back pedal to turn and run with receivers. A little known fact about him is he plays with a physicality that belies his baby face. Elite speed is the one thing he lacks but he can more than make up for that with his play style and intelligence. 9. LB Joseph Ossai, Conroe Oak Ridge, 6-4, 220 – Texas: He profiles as the best edge runner in the class. He has all the necessary pass rusher traits: can get low and turn the corner; needs minimal amount of steps from the line of scrimmage to the quarterback; plays with great leverage and strength to get a push; plays with burst off the line. Ossai also has the directional ability to make shallow drops and cover the flat. Perhaps most importantly as it pertains to hitting his ceiling, he also comes equipped with one of the best mental evaluations I can recall. I account for that a ton, even if I don’t always mention it in these blurbs. Some times it’s not good at all but Ossai is a five-star in his regard who challenges his teammates. 8. DB D’shawn Jamison, Houston Lamar, 5-10, 175 - Texas: Lamar wisely put Jamison at nickel rather than corner to take advantage of his maniacal play style. He can be seen making plays all over the field he wouldn’t be able to make if he was marooned on an island. He’s an electric athlete; the kind that can play on either side of the ball and break games open as a returner. He’ll need to get bigger to be able to grapple in the run game but that will come. 7. TE Mustapha Muhammad, Fort Bend Ridge Point, 6-4, 235 – Michigan: The exceedingly rare dual-threat tight end who can block and receive with equal ability. He impressed me long ago by detailing how important blocking was to him. He stated he knew that would play a big part in making it to the NFL. Michigan is a great fit for him both athletically and academically. 6. DB DeMarvion Overshown, Arp 6-4, 200 - Texas: He’s very raw when it comes to defensive back technique but he’s so long, athletic, and downright destructive that it won’t be hard to find him a role. He’s an explosive athlete but he’s much more, he’s a real football player, just in search of the right fit. Todd Orlando is the guy to find that for him. 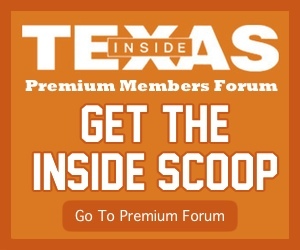 With Overshown, and the rest of the safety haul, Texas will probably be allowed to play in dime because the staff won’t have to trade much physicality versus the run by pulling a linebacker. Overshown could find himself in a role similar to Jason Hall this past season. 5. WR Jalen Preston, Manvel, 6-1, 210 – Texas A&M: I’m not really sure how you defend Preston. You can do pretty much everything right and he’ll still make a play. All 11 better pursue when he has the ball. When I saw him in Oregon I was impressed to see him rocketing low off the line. He had noticeably leaned up and along with his leaping ability and ball skills it was immediately apparent he was one of the most abrupt players in a star-studded setting. This explosiveness comes as no surprise to anyone who has seen him play basketball. He’s raw as a route runner but has more than enough athleticism and body mechanics become good in that regard. Even if he just went out and played like an athlete he’d make a name for himself on the next level. He’s an easy guy to get the ball to. 4. DB BJ Foster, Angleton, 6-1, 195 – Texas: What I stated above regarding Jordan Moore playing running back definitely applies to Foster. As a runner he’s explosive, fluid, and physical. He’s lacking reps in the secondary but he has great football instincts. Everyone knows he can run and hit. Foster is a quiet leader. In a day and age where everyone chronicles their workouts via social media, he just goes out and puts in the work. Excellent range, great closing ability, and violent coming downhill versus the run. 3. 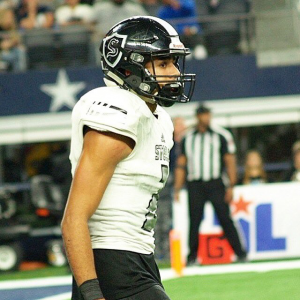 DB Caden Sterns, Cibolo Steele, 6-0, 190 – Texas: One of the more mentally prepared players in the class and also one of the more versatile. Sterns plays with the instincts and run support ability his brother Jordan did, but he has better length that he makes the most of defending the passing game. Good range, good hips, and good eyes. He’s incredibly well rounded. He can play either safety plus nickel/dime. I expect he’ll hit the field in some capacity this season. 2. WR Jaylen Waddle, Bellaire Episcopal, 5-10, 175: As explosive a receiver as you’ll find but he’s also very skilled. His agility is off the charts. 7 on 7 isn’t real football, but it’s telling when high level athletes can’t lay a finger on him in that setting. Thanks to his vertical speed and leaping ability he can play outside as well as inside. All of these athletic traits combine with possession receiver hands. 1. CB Jalen Green, Houston Heights, 6-0, 175 – Texas: A sensationally fluid athlete with great quickness and turn and run ability. He can play off with no issue, but really excels playing press because of his physicality. Because he’s spent so much of his time on offense he may lack some reps, but he’ll get up to speed in no time. Considering how much time he’s played quarterback and wide receiver, it’s amazing Green is as nuanced as he is on defense. I believe Green is the best bet in the class to marry his considerable talent to production and that’s why I have him #1.